Surprising gravitational similarities between spiral and elliptical galaxies have been discovered by an international team, implying the influence of hidden forces. In the first such survey to capture large numbers of these galaxies, researchers have mapped out the motions of stars in the outer parts of elliptical galaxies using the world’s largest optical telescope at W M Keck Observatory in Hawaii. “By combining Keck telescope time from Swinburne and the University of California, we were able to investigate a larger number of galaxies which allowed us to make this important discovery,” Swinburne’s Professor Duncan Forbes said. The team, led by Michele Cappellari from the University of Oxford, used the powerful DEIMOS (DEep Imaging and Multi-Object Spectrograph) to conduct a major survey of nearby galaxies called SLUGGS, which mapped out the speeds of their stars. The scientists used Newton's law of gravity to translate these speed measurements into the amounts of matter distributed within the galaxies. 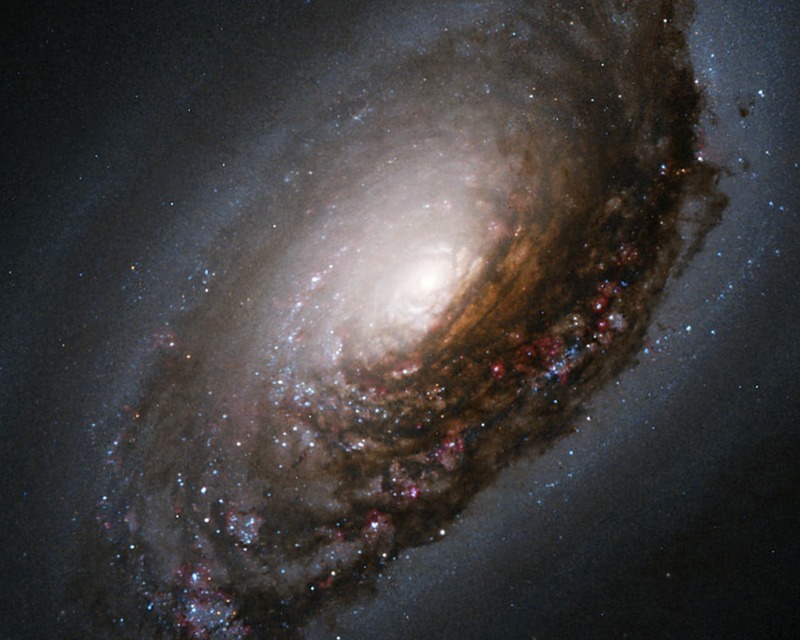 One of the most surprising scientific discoveries of the 20th century was that spiral galaxies, such as our own Milky Way, rotate much faster than expected, powered by an extra gravitational force of invisible ‘dark matter’. Since this discovery 40 years ago, we have learned this mysterious substance, which is probably an exotic elementary particle, makes up about 85 per cent of the mass in the known Universe, leaving only 15 per cent to be the ordinary stuff encountered in our everyday lives. Dark matter is central to our understanding of how galaxies form and evolve and is ultimately one of the reasons for the existence of life on Earth – yet we know almost nothing about it. The image below illustrates speeds of stars on circular orbits have been measured around both spiral and elliptical galaxies. 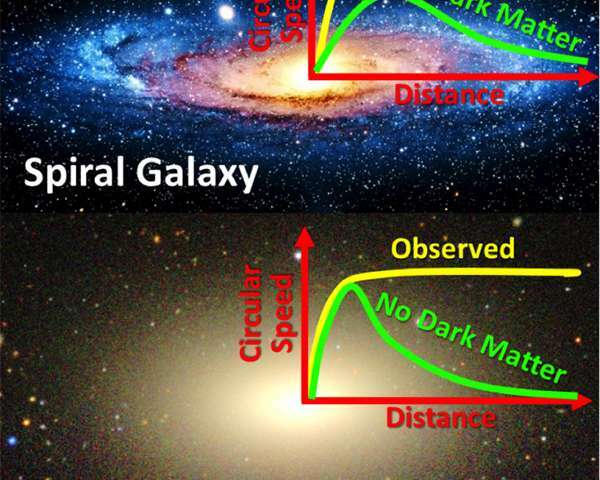 Without dark matter, the speeds should decrease with distance from the galaxy, at different rates for the two galaxy types. Instead, the dark matter appears to conspire to keep the speeds steady. (M. Cappellari and the Sloan Digital Sky Survey. But the ‘conspiracy’ does not come out naturally from the models, and some fine-tuning is required to explain the observations. For this reason, some astronomers have suggested that, rather than being due to dark matter, it may be due to Newton's law of gravity becoming progressively less accurate at large distances. Remarkably, decades after it was proposed, this alternative theory (without dark matter) still could not be conclusively ruled out. Spiral galaxies constitute less than half of the stellar mass in the Universe, which is dominated by elliptical and lenticular galaxies. These have puffier configurations of stars and lack the flat disks of gas that spiral galaxies have. Until now it has been technically difficult to measure the masses of elliptical galaxies and to find out how much dark matter they have, and how this is distributed. Because elliptical galaxies have different shapes and formation histories than spiral galaxies, the newly discovered conspiracy is even more profound and will lead experts in dark matter and galaxy formation to think carefully about what has happened in the ‘dark sector’ of the Universe..